Brian O''Conner, now working for the FBI in LA, teams up with Dominic Toretto to bring down a heroin importer by infiltrating his operation. 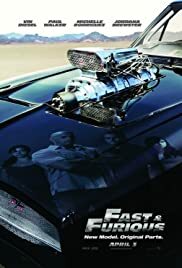 THE RECOMMENDATION: Now on my fourth film in the franchise, Fast & Furious has raised the bar to the level of excitement where I no longer care about asking questions and raising complaints. It still is by no means a perfect film, but then again, I don’t really expect any of the Furious movies to do that. What I’m looking for in these films, and have finally gotten in Fast & Furious is a story which drives the action. Questionable choices were made with regard to plot twists and why certain things unfold the way they do (the only purpose the opening sequence serves is to say, “Hey cool car heist!”), but for the most part, the story is now good enough to be on semi-equal footing with the cars. My recommendation for any franchise, if you care about it at all, is to watch all the films — I’m a completionist that way. I actually started with the sixth film, Fast & Furious 6, almost three years ago and just now am getting around to watching the rest. However, for those non-completionists out there, this film is probably the best entry point for you. Fast & Furious doesn’t rely heavily on the previous films so it won’t be confusing for new viewers, and it’s what I’d consider the best movie so far.